This review for Inhairit Hair Growth Vitamins will help inform and advise customers on whether or not to purchase this product. Inhairit vitamins are designed to treat thinning hair, hair loss and alopecia. The official website claims that the vitamins reduce premature and excessive hair loss, stimulates new hair growth and rejuvenates dead hair follicles. It is marketed as a good alternative to topical hair regrowth products. 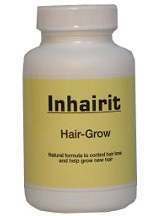 Inhairit Hair Growth Vitamins are available online from their official website. Inhairit Hair Grow Vitamins are made with a mixture of natural Himalayan herbs. The official website only states that customers should ingest one Inhairit capsules three times daily. No information is given on whether or not the capsules must be taken with food or not. Inhairit vitamins are currently available from their official website. The official website sells them in three month supplies. A three month supply, a total of 180 capsules, is currently available for a discounted price of $108.95, 15% off of the regular price of $128.85. After purchasing the three month supply, I have been taking the vitamins three times daily for almost five weeks now, I have not noticed any real noticeable signs of improvement for my thinning hair as of yet. However, results might start to be noticeable after three months of continuous use; the vitamins are sold in bundles that only last three months. The official website includes a warning to not take more than the recommended dosage of three times a day unless otherwise stated by a health care practitioner. It also states that if any adverse side effects are observed, customers must immediately stop taking the vitamins and consult a doctor. Inhairit offers a limited money back guarantee on their products. Refunds must be requested within 120 days of the purchase, and proof of purchase is required. Refunds are only given to products returned in original packaging, unopened and unused. Customers must, however, pay return shipping fees unless the nature of the return is a shipping error made on their end. No customer reviews are found on their official website. Inhairit Hair Growth Vitamins is a natural remedy for hair loss made with natural native herbs that aims to treat thinning hair and hair loss. The vitamins are a nice all natural alternative to the other topical hair regrowth products currently in the market. Being tablets, they are also very easy to use and treatment is not a time consuming process. However, the vitamins currently come at a slightly steep price, even with the discount, because of the recommended three times a day dosage. Their limited money back guarantee is slightly lacking. The vitamins can only be purchased in a package of three bottles, and I do not think they will accept individual bottles of the vitamins for a refund. The lack of customer reviews is also slightly disconcerting.